The eukaryote cytoskeleton. 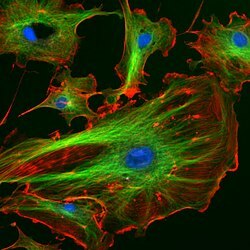 Actin filaments are shown in red, microtubules in green, and the nuclei are in blue. The cytoskeleton is a kind of scaffolding present in all cells. It is made of protein. It keeps cell shape, protects the cell and enables cells to move (using structures such as flagella and cilia). It helps transport inside the cytoplasm (the movement of vesicles and organelles, for example), and in cell division. The concept and the term (cytosquelette, in French) was introduced by French embryologist Paul Wintrebert in 1931. Eukaryote cells contain three main kinds of cytoskeletal filaments, which are microfilaments (actin filaments), intermediate filaments, and microtubules. They give the cell structure and shape. Cytoskeletal elements interact closely and often with the cell membrane and the endoplasmic reticulum. ↑ Frixione E (2000). "Recurring views on the structure and function of the cytoskeleton: a 300-year epic". Cell motility and the cytoskeleton 46: 73–94. doi:10.1002/1097-0169(200006)46:2<73::AID-CM1>3.0.CO;2-0. PMID 10891854. ↑ Minton AP (October 1992). "Confinement as a determinant of macromolecular structure and reactivity". Biophys. J. 63 (4): 1090–100. doi:10.1016/S0006-3495(92)81663-6. PMC 1262248. PMID 1420928. http://www.biophysj.org/cgi/reprint/63/4/1090. Wikimedia Commons has media related to Cytoskeleton. This page was last changed on 25 September 2014, at 17:25.